Instant downloads of all 942 LitChart PDFs (including Cathedral). 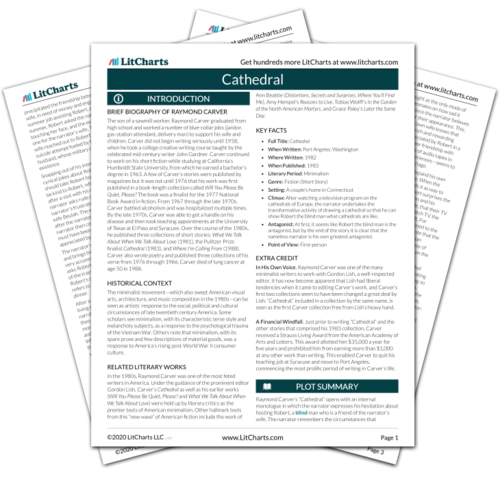 Welcome to the LitCharts study guide on Raymond Carver's Cathedral. Created by the original team behind SparkNotes, LitCharts are the world's best literature guides. A concise biography of Raymond Carver plus historical and literary context for Cathedral. A quick-reference summary: Cathedral on a single page. In-depth summary and analysis of every of Cathedral. Visual theme-tracking, too. Explanations, analysis, and visualizations of Cathedral's themes. Cathedral's important quotes, sortable by theme, character, or . Description, analysis, and timelines for Cathedral's characters. Explanations of Cathedral's symbols, and tracking of where they appear. An interactive data visualization of Cathedral's plot and themes. The son of a sawmill worker, Raymond Carver graduated from high school and worked a number of blue-collar jobs (janitor, gas-station attendant, delivery man) to support his wife and children. Carver did not begin writing seriously until 1958, when he took a college creative writing course taught by the celebrated mid-century writer John Gardner. Carver continued to work on his short fiction while studying at California’s Humboldt State University, from which he earned a bachelor’s degree in 1963. A few of Carver’s stories were published by magazines but it was not until 1976 that his work was first published in a book-length collection called Will You Please Be Quiet, Please? The book was a finalist for the 1977 National Book Award in fiction. From 1967 through the late 1970s, Carver battled alcoholism and was hospitalized multiple times. By the late 1970s, Carver was able to get a handle on his disease and then took teaching appointments at the University of Texas at El Paso and Syracuse. Over the course of the 1980s, he published three collections of short stories: What We Talk About When We Talk About Love (1981), the Pulitzer Prize finalist Cathedral (1983), and Where I’m Calling From (1988). Carver also wrote poetry and published three collections of his verse from 1976 through 1986. Carver died of lung cancer at age 50 in 1988. Get the entire Cathedral LitChart as a printable PDF. The minimalist movement—which also swept American visual arts, architecture, and music composition in the 1980s—can be seen as artists’ response to the social, political and cultural circumstances of late twentieth century America. Some scholars see minimalism, with its characteristic terse style and melancholy subjects, as a response to the psychological trauma of the Vietnam War. Others note that minimalism, with its spare prose and few descriptions of material goods, was a response to America’s rising post-World War II consumer culture. In the 1980s, Raymond Carver was one of the most feted writers in America. Under the guidance of the prominent editor Gordon Lish, Carver’s Cathedral as well as his earlier works (Will You Please Be Quiet, Please? and What We Talk About When We Talk About Love) were held up by literary critics as the premier texts of American minimalism. Other hallmark texts from this “new wave” of American fiction include the work of Ann Beattie (Distortions, Secrets and Surprises, Where You’ll Find Me), Amy Hempel’s Reasons to Live, Tobias Wolff’s In the Garden of the North American Martyrs, and Grace Paley’s Later the Same Day. Climax: After watching a television program on the cathedrals of Europe, the narrator undertakes the transformative activity of drawing a cathedral so that he can show Robert the blind man what cathedrals are like. Antagonist: At first, it seems like Robert the blind man is the antagonist, but by the end of the story it is clear that the nameless narrator is his own greatest antagonist. In His Own Voice. Raymond Carver was one of the many minimalist writers to work with Gordon Lish, a well-respected editor. It has now become apparent that Lish had liberal tendencies when it came to editing Carver’s work, and Carver’s first two collections seem to have been changed a great deal by Lish. “Cathedral,” included in a collection by the same name, is seen as the first Carver collection free from Lish’s heavy hand. A Financial Windfall. Just prior to writing “Cathedral” and the other stories that comprised his 1983 collection, Carver received a Strauss Living Award from the American Academy of Arts and Letters. This award allotted him $35,000 a year for five years and prohibited him from earning more than $1,000 at any other work than writing. This enabled Carver to quit his teaching job at Syracuse and move to Port Angeles, commencing the most prolific period of writing in Carver’s life. Merrigan, Tara. "Cathedral." LitCharts. LitCharts LLC, 22 Mar 2018. Web. 20 Apr 2019. Merrigan, Tara. "Cathedral." LitCharts LLC, March 22, 2018. Retrieved April 20, 2019. https://www.litcharts.com/lit/cathedral.